Extremely cold weather is a problem in many parts of the United States. The Associated Press reported Wednesday that record-setting temperatures have been blamed for at least 12 deaths in recent weeks. Some forecasters say the worst weather is yet to come. On Tuesday, the U.S. National Weather Service announced wind chill advisories and freeze warnings for 40 of the 50 states. The weather service predicted a "period of much-below-normal temperatures and dangerously cold wind chills to the central and eastern U.S. over the next week." Air temperatures fell to -13 Celsius near Cullman, Alabama, which usually has a mild winter. In the port of Mobile, Alabama, temperatures reached as low as -7 Celsius. City officials opened warming shelters across the southern United States, as the cold weather brought light snow as far south as Austin, Texas. On Wednesday, a winter storm dropped snow, sleet and freezing rain from northern Florida up the Southeast coast. Some cities reported snowfall for the first time in over 20 years. Cars spun out of control on icy roads from Texas to Georgia. Hospitals across the country are reporting an increase in emergency room visits for hypothermia and other conditions linked to extreme cold. 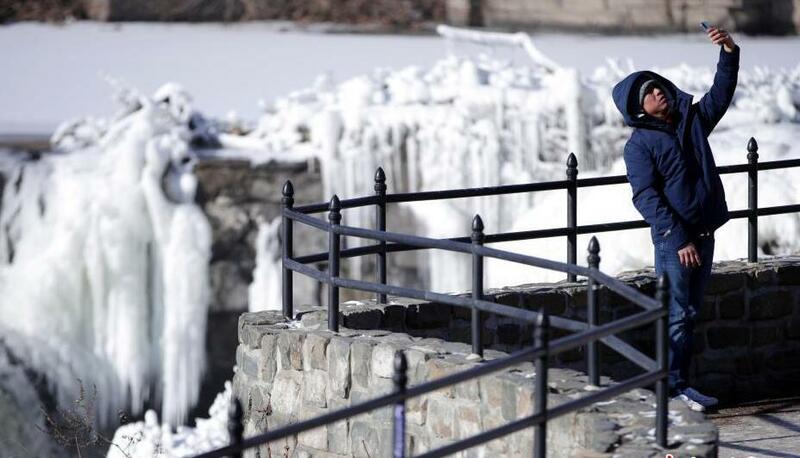 The record-setting cold weather began in the central U.S. early last week. Omaha, Nebraska, broke a 130-year record when temperatures fell to -29 Celsius. The city of Aberdeen, South Dakota broke a 99-year record with temperatures of -36 Celsius. In Florida, several water parks closed because of the cold weather. New York's Hudson River froze in some parts, forcing officials to cancel passenger ferry service. At Niagara Falls, people took photographs of the Horseshoe Falls, where flowing water had turned to ice. Frozen sharks were washing up along the coast south of Boston, Massachusetts, the Atlantic White Shark Conservancy reported. Forecasters warned that weather conditions could worsen, especially in the Northeast. A winter storm warning extended from the Florida panhandle all the way up the Atlantic coast. Coastal flooding, downed trees and power lines were possible along the East Coast. Salvage operations have been greatly assisted by the good weather conditions. Our satellite shows a possible late winter storm moving towards us at the start of next week. He is in the middle of washing up. He turned to look back, but by then she was out of sight. 5.Cars spun out of control on icy roads from Texas to Georgia. 6.Some cities reported snowfall for the first time in over 20 years.